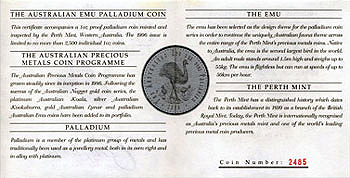 At the end of 1994 the Perth Mint received permission from the Australian government to issue a palladium coin series. 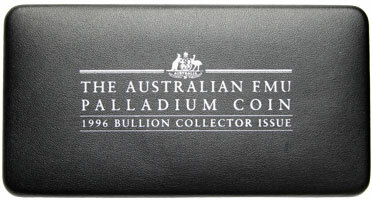 The first 40 AU$ emu palladium coin was issued in October of 1995 in proof quality. In 1996 a bullion edition (BU quality) with the motif of the proof version of the previous year was also issued. The bullion coins were packed in capsules and sold by the Perth Mint for 110% of the actual palladium price at the time of issue. 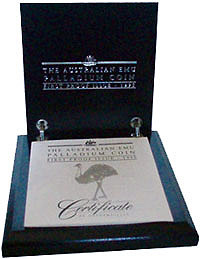 The proof issues were sold in a distinctive black wooden box including a certificate for a fixed price in a range between AU$ 350 and AU$ 425 (depending on the year). The maximum mintage per year was set at 2500 pieces in proof and 5000 pieces in BU quality (detailed issue amounts Auflagen), but not all coins were minted in the maximum allowed quantities. The production of the 1998 issue was suspended when Russia blocked the delivery of palladium, rapidly driving up the price of the metal due to low availability. 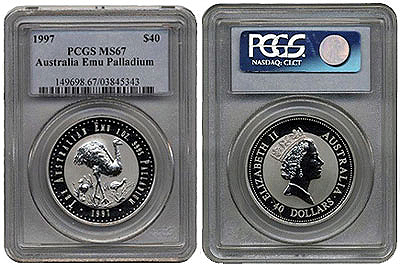 Many palladium coins were melted down at this time, and therefore one must often pay a premium fee for palladium coins minted during this period. In the year 2006 the Perth Mint resumed minting the 1998 BU emu coins, but the maximum planned amount of 5000 pieces has not been reached. One can find additional information about this extra mintage in the 1998 section. As you see on the photos, there are more differences between the both versions (BU and proof). The BU issue was primary made as an investor coin and a part of the background is matted and elements of the illustration are glossy minted. In comparison to this the proof issue has a glossy minted background and matted elements of the illustration. A proof version of a coin is always minted with special glossy polished treated coin blank and polished dies. 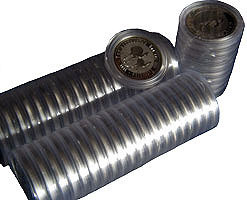 There is also a higher pressure and a restriction of the minting speed for proof coins to get the best possibly pieces. The price for the proof coins is much higher then the real material price because of this special necessary treatments. Also each proof coin has an additional “P” (the mintmark of the Perth Mint). Here I will give you an overview about the different issues. To get more detailed information about the different issues, please click on the listed minted amounts or find your right coin, when clicking on the years in the navigation on the left. issued 2.500 ? 1.144 ? 769 ? issued ? ? ? ? ? ? 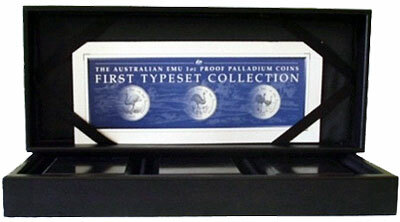 In 1997 the Perth Mint has issued a so called „Typeset“, which contains only a presentation box for the Proof coins – this box was issued without coins!n One year later the Perth Mint has issued a set, which shows on 3 Prints the motives of the coins. This prints have been issued also without the coins and should only be an extension for the proof coins. 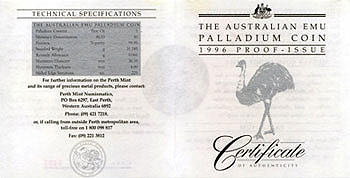 In 1995 the first Palladium coin was issued by the Perth Mint. This coin was the AU$ 40 Emu coin 1995 in the quality Proof. The maximum amount of this issue is 2.500 pieces, all pieces have been minted. The coin was sold for AU$350 official issue price in a black wooden box including a certificate to prove the authenticity. 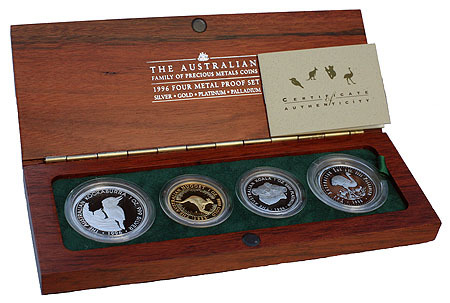 A maximum of 75 coins has also been issued in the Metal Proof Set 1995. 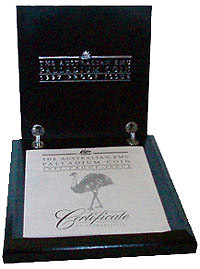 In August of 1997 the Perth Mint has issued a so called Typeset, because they want to offer collectors a noble presentation box for the proof emu coins. 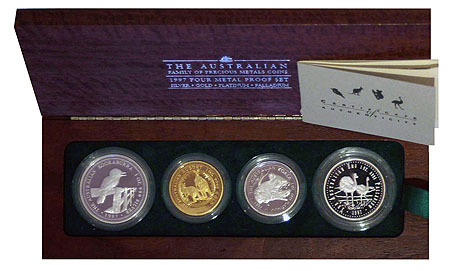 This typeset contains a black box for the three issued proof coins and a detailed booklet with information about the complete EMU series. The price without coins was AU$65, the maximal production amount was 750 pieces. 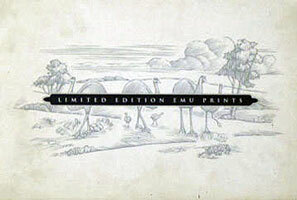 To make the EMU Palladium coins more popular the Perth Mint has issued in the beginning of 1998 a limited set of three prints (graphics) that shows the motives of the EMU issues. The prints has been designed by the designers of the coins (Louise Pinder and Milena Milan). This prints are limited to a maximum of 250 pieces and each set has its own serial number. The issue price was AU$90. In 1996 the Perth Mint has issued the bullion issue EMU 1996. The maximum mintage was 5000 pieces. A maximum of 2000 coins has been sold in a set together with a phonecard for a fixed price. The remaining coins have been sold loose in a capsule. It is not sure if they have been minted completely. The issue price of the Perth Mint was 110% of the actual palladium price. In 1996 there have been issued a maximum of 2000 coins of 1996 in a set together with a phonecard. The issue price was AU$235. This set from Australia, which contains a phonecard, is the first set with an included phonecard in the Australian coin issue history. The phonecard is unused and packed in a protective cover. In the year 1996 the Perth Mint has issued the 1996 EMU coin in proof. The maximum mintage of this issue is 2500 pieces, but only 1144 pieces has been minted! The coin was sold in a black wooden box with certificate of authenticity for AU$350. A maximum of 100 coins was issued in the Four Metal Proof Set 1996. 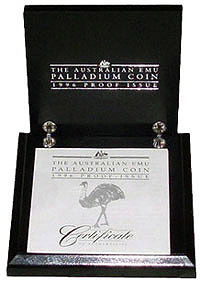 In the year 1997 the Perth Mint has issued the bullion issue EMU 1997. The maximum mintage of this issue is 5000 pieces, but it is not sure, if they have been minted completely. The issue price of the Perth Mint was 110% of the actual palladium price. 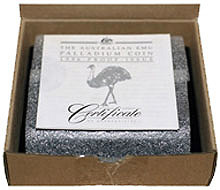 In the year 1997 the Perth Mint has issued the last Emu Palladium coin in proof. The maximum mintage was 2500 pieces, but because of the high palladium price only 769 pieces has been minted. The coin was sold in a black wooden box including certificate of authenticity for AU$425. A maximum of 100 coins has also been issued in the Four Metal Proof Set of 1997. 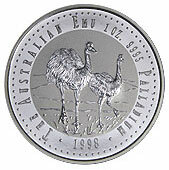 In 1998 only a small mintage of the 1998 Emu has been minted in BU version, before the production has been paused completely. Because of the up going palladium price, it was harder and harder to sell the coins. The Perth Mint has not finished the mintage, they have only suspended it. So the possibility for the mintage of the complete planned amount of 5000 pieces exists. Probably because of the palladium coins of Canada (in 2006 was issued a so called „Constellation Set“ with coins with a mintage of 300 per coin) in 2006 the Perth Mint was requested to mint palladium coins again. The Perth Mint declared that this was the wish of an overseas dealer. In Germany the 1998 palladium coins has been appeared in bigger amounts and because of this, I think that a German dealer, was responsible for this further mintages. Because of the sales problems the Perth Mint was not sure, if they should produce the coins in the maximum mintage. So they supposable they have produced „two smaller amounts“ of the 1998 EMU coins (which are included in the planned total amount of 5000 pieces), but the maximum mintage seems not to be reached. The coins of this „test amounts“ are the same, but there is a difference with the packaging in the capsule. It is possible to see the edge of the coin in the capsule in one part of the issue and not (or hard to see) possible to see it in the other capsule (you could see it in the photo). This „new mintages“ has been delivered to the dealer, who has given this order to the Perth Mint to see how this sales gain interest or not. It seems that this test has not been successfully enough, because the Perth Mint is not planning further issues for the moment. The official arguments are that the Perth Mint is not satisfied with the quality of the mintage. It is not easy to mint coins in Palladium, because there is a high error quote and it is expensive to recycle this scraps. Finally it would be important to say that the price of this coin has decreased because of this extra mintages from around 1000 Euro before to around 300 Euro. This example shows that the amount of palladium coin collectors is very little at the moment, but there could be a change in this behaviour, because the collecting of palladium coins offers a broad variety of different coins, with only very little different issues. In the United States the grading of coins by specialised companies is very popular. These companies use the Sheldon System, developed by Dr. William H. Sheldon in the year 1949, to rate the quality of a coin. There are 70 different gradings, which help defining the quality of a coin very detailed. The Sehldon System uses special letter combinations and a number from 1 – 70 (which means best quality). For coins in proof quality the Sheldon System is very useful, because there are 10 different ratings only for different proof qualities. Also it is possible that proof coins are graded under 60, if they have scratches or other damages, there exist graded proof coins under AU-50. Also in my opinion the grading system has not only advantages. There are many different grading companies in the US. A test of these companies by PNG (Professional Numismatists Guild) and ICTA (Industry Council for Tangible Assets) in the year 2006 has shown big differences between the opinions of the different grading companies. So you should not only belief in grading results, you should also have your own opinion about the quality of coins. PCGS (Professional Coin Grading System) and NGC (Numismatic Guaranty Corporation of America) have been the winners. 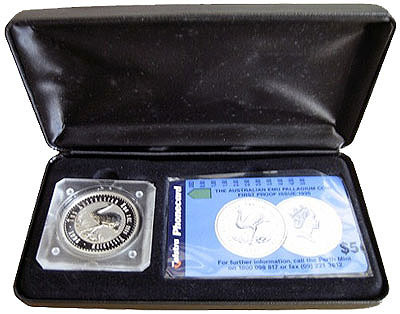 A disadvantage of graded coins is that they are not packed in their original packaging any more, because they are repacked by the grading companies in a special “coin slab”, which includes the grading certificate with the grading grade and the name of the coin and an own identification number. The problem is that the original certificates are not together with the graded coins anymore and also it is not possible anymore to see the letterings on the edge anymore. Sometimes it has been happened that the coin slabs have been opened by force and high graded coins have been replaced with lower graded coins. Coins with very good “grading” have much better prices then lower graded coins. Also there could be big price differences between a MS-69 and MS-70 graded coin in the market. At the moment there is no possibility to grade coins in Europe. Only empty coin slabs can be ordered in the US and you could do the grading yourself. To avoid such own gradings, PCGS has a special database, where all graded coins are indexed and could be find with the identification number (PCGS-database). Ende 1994 erhielt die Perth Mint vom australischen Bundesschatzamt die Genehmigung zur Ausgabe einer Palladium-Münzserie. Im Oktober des darauf folgenden Jahres erschien die erste Palladium AU$ 40 Emu Münze in der Qualität Proof. 1996 wurde die Serie um eine Bullionausgabe (Bu) erweitert, die grundsätzlich das Motiv der Proof Version aus dem Vorjahr trägt. Die Bullionausgaben wurden lediglich in einer Kapsel zu 110% des aktuellen Palladiumpreises von der Perth Mint verkauft. Im Vergleich dazu wurden die Proof Ausgaben in einem edlen schwarzen Holzetui mit Zertifikat zu einem Festpreis zwischen AU$ 350 und AU$ 425 (je nach Jahrgang) verkauft. Die maximalen Auflagen pro Jahr lagen bei der Proof Version bei 2.500 und bei der Bu Version bei 5.000 Exemplaren (detaillierte Auflagen). Allerdings wurden teilweise nicht die kompletten Auflagen ausgeprägt, da die Emu Münzen zu der damaligen Zeit nicht sehr beliebt waren. Des weiteren wurde die Produktion der 1998er Ausgabe ausgesetzt, da auf Grund Lieferblockaden von Seiten Russlands kaum Palladium zur Verfügung stand, was den Palladiumpreis stark ansteigen ließ. In dieser Zeit wurden etliche Palladiummünzen, so auch die Emus, eingeschmolzen. Dies hat zur Folge, dass heute teilweise sehr hohe Aufschläge für Palladiummünzen beim Erwerb zu zahlen sind. Im Jahr 2006 prägte die Perth Mint die 1998er Ausgabe nach. Ausführliche Infos zu der Nachprägung finden Sie in der Rubrik 1998. Das Design der Wertseite stammt von Raphael Maklouf. Bei der Bildseite wechselten sich zwei Designerinnen ab. Louise Pinder war für die Ausgaben 1995-1996 in Proof sowie 1996-1997 in Bu zuständig. Die Ausgaben 1997 in Proof und 1998 Bu wurde von Milena Milan gestaltet. Wie Sie an den beiden Bildern erkennen können, gibt es weitere Unterschiede zwischen den beiden Versionen Bu und Proof. Bei der Bu Ausgabe, welche zu Anlagezwecken gedacht war, wurde ein Teil des Hintergrundes matt gehalten und Elemente des Bildes glänzend geprägt. Im Vergleich hierzu wurde bei der Proof Ausgabe der komplette Hintergrund der Münze glänzend geprägt und die Bildelemente matt gehalten. Bei der Prägung einer Proof Münze werden speziell behandelte Ronden, die auf Hochglanz poliert wurden, sowie polierte Prägestempel verwendet. Des weiteren wird bei der Prägung von Proof Münzen ein höherer Prägedruck, sowie eine langsamere Prägegeschwindigkeit gewählt, um makellose Stücke zu erhalten. Dieser Aufwand lässt erklären, weshalb die Proof Ausgaben zu einem Festpreis, der weitaus höher war als der Materialpreis, verkauft wurden. Ein weiteres Unterscheidungsmerkmal der Proof Münze im Vergleich zur Bu Ausgabe ist, dass bei jeder Proof Münze ein „P“, als Münzzeichen der Perth Mint, auf die Münze geprägt wurde. An dieser Stelle möchte ich Ihnen eine Übersicht zu den verschiedenen Ausgaben präsentieren. Um ausführlichere Informationen über die jeweiligen Ausgaben zu erhalten, klicken Sie bitte auf die entsprechende Auflage. ausgegeben 2.500 ? 1.144 ? 769 ? ausgegeben ? ? ? ? ? ? 1997 produzierte die Perth Mint ein so genanntes „Typeset“, welches eine Präsentationskassette für die Proof-Ausgaben darstellt. Diese Präsentationskassette wurde ohne Münzen in den Handel gebracht. Ein Jahr darauf gab die Perth Mint ein Set aus, welches mittels 3 Grafiken (Prints) die Motive der Münzen zeigt. Diese Prints wurden ebenso ohne Münzen ausgegeben und dienten, wie auch das Typeset, nur zur Ergänzung der eigentlichen Proof Münzen. Sie durchsuchen derzeit das Archiv der Münzen aus Australien Kategorie.